Matt the host and Christine touch on Microsoft and the LinkedIn Acquisition One Year Later. Provide context for how Microsoft and LinkedIn are partnering to drive relationship selling impact. They talk about how CRM Systems no longer need to be a system of oppression. Christine Discusses how Machine Learning and predictive analytics change the day to day life of the seller. They talk about what an innovative solution like Microsoft Relationship Sales has in common with a well known music app (Shazam). Making the magic happen! Christine offers thoughts on how the conventional sales tactics will no longer apply. Zumda share how the use of new selling tools and technologies change the buying and selling experience? (Read the transcript and listen again on the Heinz Marketing Blog. About Our Guest: Christine Zmuda, Sr. Dir. of Sales at Microsoft. Christine says of herself: My passion and professional satisfaction comes from identifying market opportunities before they are mainstream. My most rewarding roles and accomplishments have centered around developing sales and market strategy for emerging businesses and scaling new acquisitions. I'm always open to learning more about technology and happy to share my own experiences of leading sales, marketing, and channel teams if it's helpful. On a personal note, I enjoy golf, tennis, spending time with my family and embracing new experiences. My new found love is abstract painting, the bigger the canvas the better. Touch on Microsoft and LinkedIn Acquisition One Year Later. Provide context for how Microsoft and LinkedIn are partnering to drive relationship selling impact. Talk about how CRM Systems no longer need to be a system of oppression. Discuss how Machine Learning and predictive analytics change the day to day life of the seller. Discuss what an innovative solution like Microsoft Relationship Sales has in common with a well known music app (Shazam). Making the magic happen! Explain what conventional sales tactics will no longer apply? Share how will the use of new selling tools and technologies change the buying and selling experience? 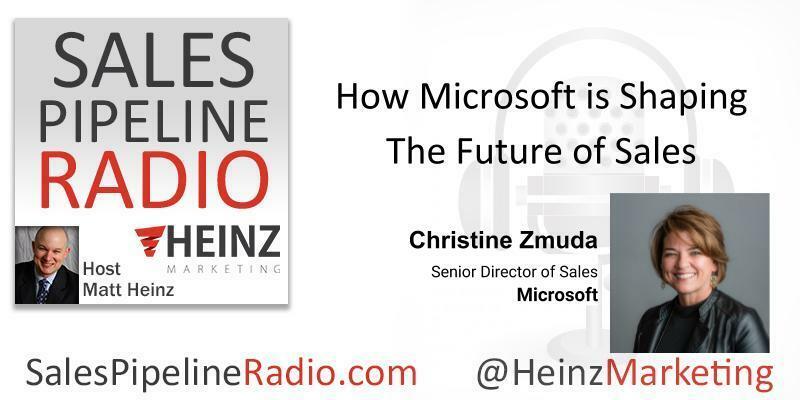 (Read the transcript and listen again on the Heinz Marketing Blog, Mon. 4/09 at 6am PST).